Alberta’s Record Size Wolf: Fact or Fiction? There’s an email currently circulating around that features a wolf shot in the Drayton Valley area in Alberta, Canada. There’s no doubting that if the photograph is real, it could be one of the biggest on record, though an official weight has yet to be documented. The timber wolf was hunted by a bear hunter, and rumor has it, this was following a recorded attack upon a black bear by the large canine. While accounts of this wolf have varied – with some stating that it weighed as much as 600 lbs, a better rough estimate of its weight by apparent wildlife experts has placed it at around 235 lbs. Though some are still questioning the true existence of a timber wolf around this size (the increased ability of individuals to manipulate with Photoshop and other software programs leads to reluctance), if in fact the wolf weighs in at this size it would be recording setting. Previously, the biggest wolf on record was 175 lb Alaskan wolf reported in 1944. Unfortunately, focus upon this wolf issue has begun for the wrong reasons. In addition to the email chain that’s circulating, the wolf is a hot topic amongst hunters on hunting forums online. While there may be others out there like it, it is possible that this wolf, if reports are true, was an anomaly. Rather than being hunted for sport, it could have been studied in a natural setting for research purpose and an increased understanding of the evolution of the species. Fact or fiction – the hype surrounding Alberta’s enormous timber wolf does make us wonder what other species are living among us that we’ve yet to discover. What do you believe? 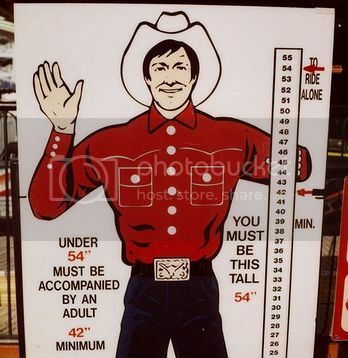 Even at 235 lbs I find it hard to believe. The Alaskan record was 175 lbs in 1944. One thing I have to say, whoever photoshopped this pic did a good job. Re: Alberta’s Record Size Wolf: Fact or Fiction? That picture and other photoshopped versions have been floating around for a few years. The last time it was in a email about Idaho wolves taken and the picture was photoshopped in several ways and passed off as different kills. It was taken over Grim's Monster Mix and there is a pic on their website. They call it a world record, but I don't know what record book. I've emailed them several times asking what the wolf scores and what book it was entered in. I have not received any response. It's no doubt a big wolf and would make Alberta book. A 235 lb wolf is not likely and would be near impossible to hold up that high off the ground. Looks like a short man holding a good sized wolf. I seen this photo too, a couple years back saying it was from Idaho too. Regardless, I guess it's a photoshopped wolf. I can't see a wolf reaching 150 lb range. I have a pretty big GS dog and he weighs in around 85 lbs. Can't imagine him at 175. It looks photoshopped to me. 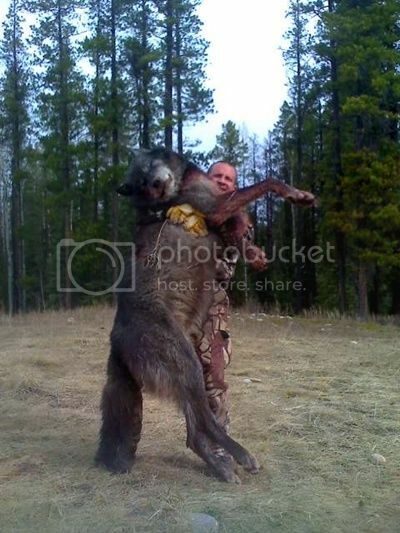 Obviously the wolf cannot weigh 600 lbs and have the man hold it the way he is, personally I dont believe he could hold a 200 lb animal like that off the ground. From what I remember this wolf was in big buck magazine. The guy holding it is not the guy who shot it. From what I remember they brought it to trophy book archery to show it off in the dan hungle days and there were a few more pics with it. That photo isn't photo shopped. We picked up a road killed wolf a few years ago and he was in the 140lbs range. 235lb is far fetched but I could see 150-175 for sure. There's some big ones out there for sure. For body size, this is the biggest I've had my hands on. He was one of three we snared at one station. It was all I could do to wrestle him onto the quad- with my daughter's help. I don't know what he weighed, not have I ever measured the skull but he was BIG. Definately got some funny looks driving through Caroline with a short box truck, a quad, and three wolves tied down anywhere I could find space!! Thanks for clearing up the "myth". So what did it weigh? What record book is it in? Clear up the myth then. Makes for a good conversation piece but for sure it is shopped.